I have been down with a virus for the last couple of days, which is why there haven’t been any new posts. I feel on the road to recovery now, and my smelling and tasting seem back to normal. I’ve been thinking about the sweet, creamy pumpkin cheesecake I made last Thanksgiving and how I would like to have some to go with my coffee right now. I’m sure it would immediately make me feel so much better. This cheesecake is interesting because it doesn’t have any pumpkin pie spice in the actual cheesecake. The traditional cinnamon and ginger are in the crust and don’t obscure the pure pumpkin flavor. The pumpkin puree and sugar are cooked together first until they are darkened and practically caramelized, intensifying the pumpkin flavor. No pale pumpkin pie flavor here, people. This is the real deal. And did I say how creamy it is…smooth and creamy on your tongue, with the spicy cookie crust adding its complementary notes and crunch. I mean it, this is the best cheesecake you will ever eat! When we had this at Thanksgiving, I served it with a dollop of whipped cream on the top. But for the photograph I wanted to give it a little more drama, which is why we have home-made marshmallows sprinkled on top. I had always wanted to make marshmallows and this was the perfect excuse. Any marshmallows left over can be used in hot chocolate or to make s’mores. Or just to eat; they’re really good. 1. Preheat the oven to 350 degrees. Grease the bottom and sides of a 9x 2 1/2 -inch or higher springform pan. 2. In a food processor, process the cookies with the pecans, sugar, salt and cinnamon (if using) until the cookies become fine crumbs, about 20 seconds. Add the melted butter and pulse about 10 times, just until incorporated. 3. Using your fingers or the back of a spoon, press the mixture into the base of the prepared pan and partway up the sides. Lay plastic wrap over the crumbs to keep them from sticking to your fingers. Be sure to press the bottom thoroughly so that the crumbs are evenly distributed. Wrap the outside of the pan with a double layer of extra-wide heavy-duty aluminum foil to prevent water leaking in from the water bath . 4. In a small, heavy saucepan, combine the pumpkin puree and sugar. Over medium heat, bring the mixture to a sputtering simmer, stirring constantly, about 5 minutes. Turn the heat to low and cook stirring constantly, until the mixture has darkened somewhat, about 5 minutes. 5. Scrape the pumpkin mixture into a large food processor and process for 1 minute with the feed tube open (so steam can escape), scraping down the sides. With the motor running add the chilled cream. Add the softened cream cheese and process for 30 seconds or until smoothly incorporated, scraping down the sides two or three times. Add the eggs and yolks and process for about 5 seconds, just until incorporated. 6. Pour the batter into the prepared pan. Set the pan in a larger pan (a 12×2-inch cake pan or a roasting pan and surround it with 1 inch of very hot water. Bake the cheesecake for 45 minutes. Turn off the oven without opening the door and let the cheesecake cool for 1 hour. 7. Transfer the cake to a rack (the center will still be jiggly) and cool to room temperature, about 1 hour. Cover the pan with plastic wrap and refrigerate for at least 6 hours or overnight. 8. Unmold cheesecake onto serving platter. Garnish as desired. 1. Sift half the powdered sugar in a heavy layer onto a parchment-lined baking sheet and set the rest aside. 2. In a small saucepan, stir together ¼ cup water, 1 cup granulated sugar, and the corn syrup. Over medium heat, bring the mixture to a boil, without stirring. As soon as the surface of the syrup is covered with bursting bubbles, begin to beat the egg whites. 3. In an electric mixer fitted with the whisk attachment, beat the egg whites on low until frothy, about 2 to 3 minutes. Turn the mixer up to medium-high, sprinkle in the remaining 1 tablespoon of granulated sugar, and beat until stiff, glossy peaks form. 4. Continue cooking the sugar mixture without stirring for about 4 to 5 minutes, until it reaches the soft ball stage – 234 to 240 degrees F on a candy thermometer. Drop some of the sugar syrup in cool water and it should form a soft ball. If it doesn’t, continue boiling for a minute and repeat the water test until it forms a soft ball. Remove from heat. 5. Place the gelatin in a small bowl and pour 2 tablespoons of the water over to cover, making sure it is completely saturated. Stir the gelatin mixture and the vanilla into the sugar syrup. 6. Mixing on high, very gradually add the syrup to the egg whites, pouring in a thin, steady stream. If some of the syrup sticks to the side of the bowl, leave it. Keep beating, for another 3 to 4 minutes, until shiny and glossy, but still warm. 7. Pour the marshmallow onto the powdered parchment paper and sift a generous layer of the remaining powdered sugar over the surface. Using your hands, press the marshmallow into a rectangle of desired thickness. Allow to set at room temperature for at least 1 hour. 8. Cut the marshmallow into desired shapes with a chef’s knife that has been run under cold water and dried. Dip the cut sides of marshmallow in additional powdered sugar to prevent sticking together. 9. The large marshmallow rectangle can be made several days in advance, wrapping the baking sheet thoroughly with plastic wrap to keep it from drying out. 10. Store cut marshmallows in an airtight container at room temperature. Favorite Fall Things: Starbucks Pumpkin Spice Latte and more! + Gift Card Giveaway!!! When I make marshmallows I package them up and give them away, people always comment: “I didn’t know you could make those.” This past Christmas I ground peppermint in the powdered sugar and served them with hot cocoa. I’m sure the cake was divine! This is picture-perfect, what a great photo! I can only guess the dessert itself is as delicious as it looks. 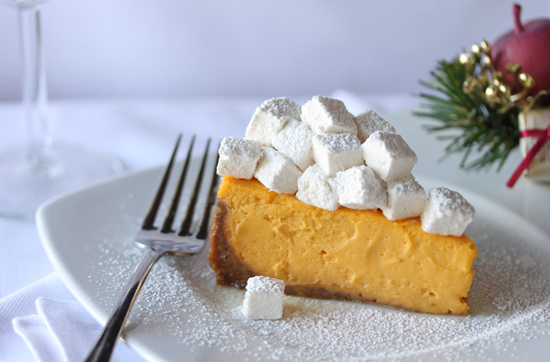 The “real deal” pumpkin flavor & homemade marshmallows, I’m sold on this cheesecake! Glad to hear your taste buds are coming back! That is everything I could want on a plate. I responded to your comment on my blog, but I wanted to write here also to say thank you for the recipe and pictures! I can’t wait to try making your cheesecake! I can only hope it turns out as pretty as yours did! Hello! My name is Lynne Hemer and I am a woman obsessed with food and cooking, in search of new, unusual, exotic and sublime ingredients and recipes. I love reading cookbooks, taking cooking classes, going to restaurants, photographing food, and blogging about it all! I hope you enjoy my website as much as I enjoy creating it.